I am very excited to be reaching out to you as Wahconah prepares to embark on its 57th school year! Mr. Steve Messina, our Assistant Principal, and I are looking forward to working with the staff, students, and families of our great school. One of our main goals is to keep our line of communication open as often as possible in an effort to keep you apprised of all of all of the wonderful happenings at Wahconah. As many of you are aware, the voters of CBRSD overwhelmingly favored conducting a feasibility study of Wahconah in an effort to explore the possibility of a renovation or rebuild of our school. Since that time, the Wahconah School Building Committee has been working with the Massachusetts School Building Authority (MSBA) to follow through with that process. The School Building Committee meetings are open to the public, and once they resume later in September, we will be sure to let you know. If you would like to learn more about the School Building Project and the MSBA process, go to the CBRSD website and click on the “Wahconah Building Project” tab toward the top of the page. 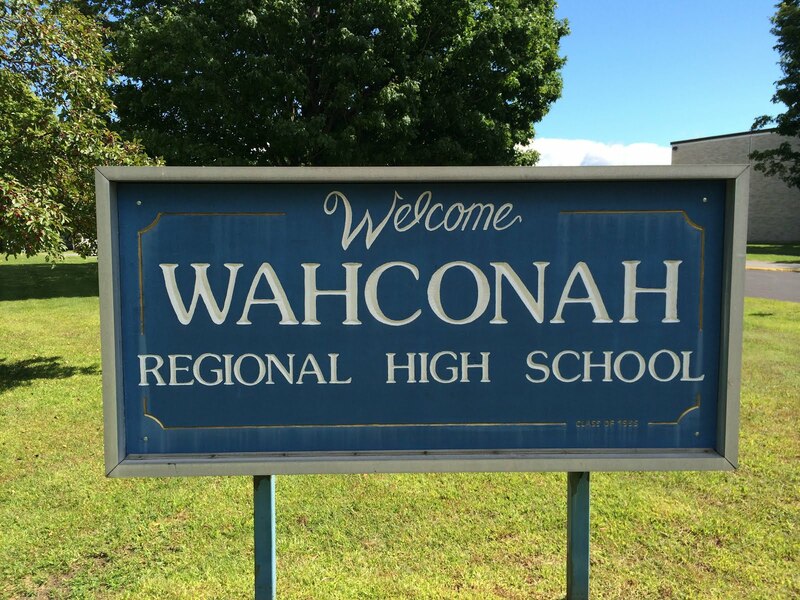 Though the feasibility process will consume more than a year, it is extremely exciting to be entertaining the prospect of creating a new and improved Wahconah to serve the students of our district well into the 21st century! We would also like to take a moment to welcome the Class of 2021 as they embark on the first of four successful years here at Wahconah. We are certainly looking forward to helping you learn and grow over the next several years. And congratulations to the Class of 2018 as they begin what I’m sure will be a memorable Senior year. In spite of a record number of snow days, this school year has passed by at a dizzying pace and now we are already at the doorstep of 4th Quarter! It has been quite an eventful school year and we still have plenty in store for what remains. Generally speaking, 4th quarter moves rather quickly at Wahconah. As the snow begins to melt and the temperature starts to rise, it is my hope that our students will do their best to maintain their focus on their academic obligations. Success in school, as well as pretty much everything else, is all about the little things you day in and day out to put yourself in the best position to succeed. But at the end of the day, it’s most important that our students keep their eyes on the prize and finish strong. Below you will find a brief rundown of what each class can expect for the rest of the year. Our newest Warriors are no longer confused by the bell schedule and the layout of the school. For all essential purposes, they are already sophomores! They have settled quite nicely into "high school life" and are starting to consider what comes next for themselves. Many of our freshmen will be taking the Biology MCAS in early June. This paper and pencil test will have a different feel to it as it will count toward their quest for a high school diploma. We also ask that parents please remember that one big change for our freshmen is the final exam experience (we call them Summative Assessments at Wahconah). They occur on the last four days of school (June 19-22) where students will have up to two exams per day. We will be sure to communicate more about Summative Assessments as they draw near. Finally, our Freshmen will be taking a field trip on June 2nd (Senior Assembly Day). Ms. Polo and Ms. Harrison will have more to say about that at a later date. The sophomore year seems to be one that is, for better or for worse, full of testing. In addition to the final exams that the rest of our students take, our Sophomores also take the MCAS, many take the PSAT, and some attempt an AP exam or two. Many of our Sophomores took the PSAT this fall and the ELA MCAS in March. The Math MCAS will take place in May and some of our sophomores will be taking the Science MCAS in early June. Once the sophomore year comes to a close, we find that they are able to put all of the testing behind them and begin to focus on certain areas of interest to them and even start thinking about their post-high school plans. The Junior year in many respects can be the busiest year in high school. Many of our Juniors are assuming leadership roles and are taking the reins as organizers of various class and school events. The three main events our Juniors are responsible for are Turkeyfest (which happened in November), Prom in late May, and Senior Assembly on June 2nd. I've always found Junior year to be a fascinating one because you can see our Juniors transforming into true young men and women. I'm already looking forward to working with these future Seniors next year! Mr. Messina and I will be meeting with our Seniors just before April vacation to talk about the end of the year. Their last day of classes will be May 19th with senior final exams taking place the following week. They will have three mandatory graduation rehearsals and plenty to do during Senior Week as well. Though they do not realize it now, their life as Wahconah Seniors actually gets BUSIER after their last day of classes! While I could take plenty of time here to express my sentiments toward our Seniors, I will instead save that for my Graduation Speech. Believe it or not, I'm already putting thoughts to paper in preparation for that speech! Let it suffice to say, this is a special group of young men and women. Though we still have a quarter of a school year left, I would like to take this moment to thank all of our Wahconah Families for your support and dedication to our students and our school. On a personal note, I've truly appreciated getting to know many of you in my new role as Principal. I've always believed that Wahconah has great students and I know precisely why. On behalf of the staff at Wahconah, thank YOU for giving us an opportunity to work with your amazing kids! We have officially surpassed the half way point of the year now that we’ve entered 3rd quarter (2nd semester). I last wrote in the space in November as we were completing the process of settling into a new school year. It’s absolutely amazing how fast the time is flying by. We have many plans in motion for the remainder of the school year, some of which are explain below. While our students and staff are hard at work in class, our Guidance and Main Office staff are already planning for next school year. We just recently updated our Program of Studies for the 2017-18 school year and will be posting it on the Wahconah website, presenting it to the parents of the incoming Class of 2021, and our guidance counselors will be reviewing it with all of our students in grades 9-11 in their English classes. We’ve added two new science classes and have updated our Performing Arts offerings as well. Students will be taking part in Advising Day on Feb. 8th where they will sign up for their courses for next year. In the meantime, we encourage all students to talk to their current teachers about their options for next year with regards to their specific courses. We also encourage all students to seek advice from their guidance counselor in the days leading up to Advising Day. We will be holding our first-ever Electives Fair for students in grades 9-11 the morning of Feb. 6th in the gym. Each class will be invited to the gym for one period to meet our elective teachers and learn more about what we have to offer. Each teacher will have a display complete with interactive opportunities and handouts for students to review as they begin to consider what courses they want to take next year. Then, two days later, students will sign up for their courses on Advising Day. We hope this new approach to informing our students about our elective programming will help students decide what to take next year. Early in September I informed every one of our intent to breathe new life into the Wahconah School Advisory Council. I am happy to report that we’ve accomplished that! Many thanks to the following parents for helping to make our school a better place for all: Adam West, Kelly Rinaldi, Beth Frederick, Amanda Garceau, and Billie Henderson. We meet once per month from 6-7pm in the Library. While other district schools have PTOs, this group does not take part in any fundraising or work of that nature. Their role is purely to advise me and our staff (indirectly) as we seek to make necessary improvements at Wahconah. If this is something you think you could contribute to, please contact me at arobb@cbrsd.org and I can give you more information. School administrators across the country are constantly trying to find ways to pull the right lever and push the right button to ensure the overall school experience for each student can be improved. Consequently, more and more school administrators are taking part in the Student Shadow Challenge. While this is typically conducted nationwide in February, I’ve made it a goal of shadowing up to four students this school year (one per grade) for the entire day. Back in November I ditched the tie, walkie-talkie and dress shoes for jeans and sneakers to become a Wahconah senior for the day (for the first time in 25 years). Senior Jonathan Bailey was gracious (and brave) enough to let me follow him throughout his day starting with homeroom right through our very last class in Accounting. I took a test in Spanish V (though I never took the course in school) and I shook off some rust to solve some Pre-Calculus problems as well. It was one of the most professionally rewarding experiences as an educator that I’ve ever had. And I’m doing it again! On Jan. 30th I will be shadowing 9th grader Mikayla Lenski which means I’ll be taking PE and joining the Wahconah band in the afternoon. Why is this important? This is a student empathy project. As an adult working in a school, it’s very easy to occasionally lose sight of what it’s like to be a student on daily basis. Therefore, the overarching goal is to learn what school feels like for our students. At the conclusion of the day I organize my notes and report back to our staff to inform them of my experience. This is not intended to be evaluative in any way. It’s simply informative. We are very lucky at Wahconah to have a teaching staff who are comfortable with their Principal engaging in this sort of endeavor, so I am forever thankful for their support. And I’m forever thankful for our students who are accepting of the new “kid” who shows up in their respective classes. In Western Massachusetts, over 200,000 people face hunger. These people have to make the difficult choice of using their money to purchase food vs. other basic necessities such as housing, clothing or transportation. Many of these people (over 20% of whom are children) look to food banks to help alleviate their hunger needs such as local food pantries like St. Agnes in Dalton or the United Methodist Church in Dalton. These organizations struggle to get funding to feed those in need. The Wahconah Regional High School chapter of the National Honor Society raises money for these and other food banks by holding an annual Empty Bowls Event at the First Congregational Church in Dalton on Saturday, November 12th from 6-8PM. “Empty Bowls” allows local artists to create and donate bowls, while the students make and serve a simple meal. Guests choose a bowl to use that day and to keep as a reminder of all the empty bowls in the world. In exchange for the meal, and the bowl, guests contribute a suggested minimum donation. One hundred percent of each meal's proceeds are devoted to local hunger-fighting organizations, such as food banks or soup kitchens, or to national or international charitable groups. Please consider joining us on Nov. 12th! Parents and Guardians of 9th and 10th graders are reminded to send in a copy of your student’s most recent physical exam, including their immunization record. Health Screenings of the ninth graders will begin during the second quarter of the school year; these will include measurement of height and weight, as well as postural, visual and hearing screening. These screenings are required as set forth by the Department of Public Health. It is highly recommended for all students and family members to get their annual ‘flu’ shot. The vaccine helps protect against a variety of respiratory born influenza viruses. The vaccine can help reduce the severity and duration of symptoms and helps prevent complications. Besides getting the annual ‘flu’ shot, best practices to stay healthy include thorough handwashing at regular intervals, covering sneezes and coughs with the elbow, getting at least 8 hours of sleep every night, eating regular meals with at least half the foods being fruits and vegetables and getting regular exercise. Please keep the school nurse informed of changes in your student’s health, such as development of a communicable illness including Strep, Mononucleosis or Influenza or with another illness. Please also let the school nurse know if your student sustains a significant injury, whether during a school sporting event or otherwise after school hours. Students considering a career in a health related field may be interested in attending our next School Health Advisory Committee meeting. It will be held on Wednesday November 16 at 3:30 at the Nessacus Regional Middle School Library. The group includes representatives of parents/guardians, students, school committee, physical education, school nurses, food service and administration. We meet quarterly to discuss health issues of the district students in general to consider changes needed in district policy. In the past we have proposed changes to the wellness policy and the water bottle policy. All parents and guardians and students are invited to attend. We have successfully completed first quarter and we are now settling into 2nd term. Since I last wrote to you, we have engaged in a great deal of “behind-the-scenes” work to make PowerSchool perform for the betterment of all of us. The vast majority of feedback I’ve received from Wahconah families has been positive. Furthermore, we have worked to enhance the look and function, as well as content, within our school website. We hope the improved website provides more accessible information for all of you. Finally, having been inspired by Mrs. Tierney’s “Friday Family Focus” emails at Nessacus, I have begun sending home “Wahconah Wednesday” emails to all families. Again, we’ve received great feedback on that as well. Below you will find some updates regarding some ongoing efforts here at Wahconah during the 2016-17 school year. If you are an educator, then you understand that in recent years the world of education has experienced frequent and sharp philosophical shifts. Information has become so accessible and its transference so diversified that many students have developed a view of school and learning that may not be in line with what our view once was. Given all of that, one of the most exciting elements of this school year has been our new approach to faculty meetings. We have committed ourselves to focusing our monthly meetings on true teaching and learning and less on logistical information and updates. We are conducting a year-long deep dive into conversations about what it means to be a teacher, our core values, and how to effectively collaborate with one another across all disciplines. We are exploring some rather “heavy” topics in an effort to enhance our craft so that we can better serve our students. We are pushing ourselves to learn from one another and to celebrate the good work we do more often. Furthermore, I have given more latitude to all teachers to experiment with their teaching practices, whether it be through technology or other forms of enhancements, so they can find new and creative ways to engage our students in the never-ending process of learning. · To increase math MCAS performance of the high needs sub-group. · To narrow overall MCAS performance gaps in ELA and Science. · To explore the possibility of further expanding AP Course offerings for the 2017-18 school year. · To analyze AP student performance data to inform instructional changes and address student needs. · To actively seek out and enroll AP teachers in College Board certified training. · To continue to identify remaining barriers and initiate improvement steps that increase access to general education for and inclusion of ALL students. That webpage will be updated regularly as we continue to progress through the MSBA Eligibility Period. I will also provide specific updates to all of you as they become available. I have had the privilege of living in the Central Berkshire community most of my life. I have also been fortunate to work at Wahconah for the past twenty years. During that time, I’ve fulfilled the role of teacher, coach, Assistant Principal and parent. No matter the job, I’ve always felt that our school community has risen above many others in the way we work to educate and support our students. Now that I am Principal, I have been given a tremendous vantage point to witness all of the facets of the Wahconah school community. In just a short period of time, I have become overwhelmed by a sense of pride in the way our students and staff work and the way in which our families support our school. What drives me as an educator…what drives all of us who work at Wahconah…is the opportunity to have a tremendous impact on the lives of our youth and to work, in whatever way possible, to make them good, thoughtful, educated people. We have some great things happening at Wahconah and there’s more to come. In the meantime, I will continue to relentlessly pursue what is going right and celebrate it like crazy. To all Wahconah families…thank you for giving us such terrific students. We are fortunate. Congratulations to Wahconah's John & Abigail Adams Scholarship Winners! The John and Abigail Adams Scholarship provides a tuition waiver for up to eight semesters of undergraduate education at a Massachusetts state college or university and must be used within six years of a student's graduation from high school. On behalf of the faculty and staff at Wahconah, congratulations to all! We are all very proud of you!